Morges region proposes several hotels of either family, convenient or top-class style. Morges propose a wide selection of quality accommodations. Hotels in the region are known to welcome you with a warm hospitality. Whether you visit as a couple, with friends or with your whole family, Morges region proposes several hotel types which ally elegance, comfort and modernity. Most of the hotels concentrate in the city centres; those located near Lake Geneva offer a magnificent view over the Alps. Ideally located at 200 meters from Lake Geneva and the city center, this magnificent 18th century edifice, classified as historic monument, has been completely and tastefully renovated combining luxury and modernity. The “La Fleur du Lac” hotel boasts a tree filled park on the lakefront. With idyllic surroundings on the banks of Lake Geneva, the hotel proposes a restaurant. The Novotel café and bar welcomes you to its contemporary surroundings. The terrace overlooks a park, a natural pond and a children’s playground. There is a gym with sauna and cardio area. A place of beauty, a warm welcome, comfort and tradition, make the Mont-Blanc an ideal place to stay and a charming stopover. In the summer, the beautiful shaded garden with blossoming flowers is a welcome place to relax. A historic 3 star establishment, comprising 44 rooms and suites, which combines tradition and new technologies. The “La Longeraie” Hotel and congress centre is located in a vast tree-filled park. Its quiet location makes it ideal for those looking to be within close proximity of the town centre, whilst remaining in green and calm surroundings. L’ Hôtel de Savoie offers comfortable rooms and is located between the lake and Morges town centre. The Funi Hotel welcomes you to warm surroundings. Whether for business or pleasure, you will feel at home. Set in the heart of the Parc Jura Vaudois and at the foot of Mont Tendre, the Auberge aux deux Sapins offers a splendid view of this summit and Lake Geneva. Hikers, gourmets and visitors going to or coming from Vallée de Joux appreciate both its rooms and restaurant. Located in the heart of the old village of Aubonne, the decor of the Café du Commerce resembles a Parisian brasserie of the 1900s, just like the menu card of the chef, who is renowned for his bistrot dishes accompanied by the best AOC La Côte wines. The rooms have been renovated on the theme of jazz and street art. "L’Auberge Communale Chez Yann" is situated in the center of the village We welcome you with 10 spacious and quiet rooms. Transformed into an 8-room hotel in 2012, "The House of Igor" has been fully adapted to meet the needs of today's clientele. It retains its original features of the nineteenth and twentieth centuries, including woodwork, sculptures, stucco, fireplace and fountains completely renovated. 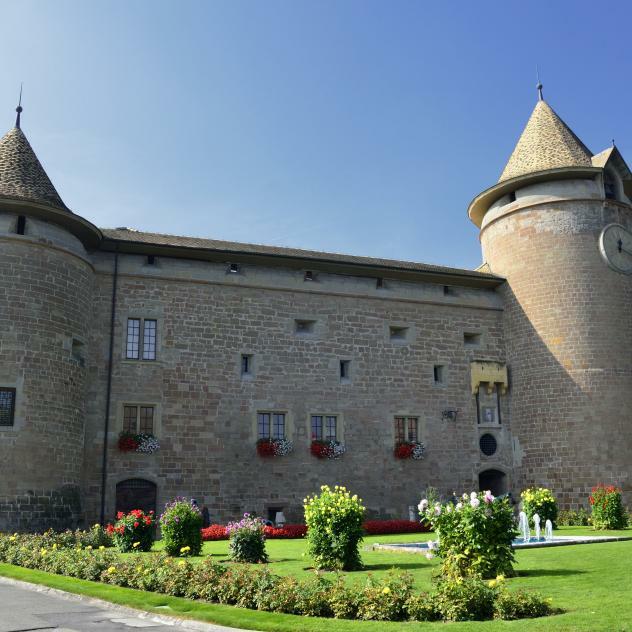 Placed between Lausanne and Geneva, the village of Aubonne dominate the vineyard of the Coast around its castle and characteristic donjon. Excellence at all levels, also thanks to the family’s cordial welcome: This is the menu of Bernard Ravet’s Restaurant L’Ermitage. Awarded with one Michelin star and 19 points in the famous GaultMillau guide, L’Ermitage is one of Switzerland’s temples of high gastronomy.